The cellphone as we know it has pretty much hit a plateau as far as designed is concerned (you've got candybars, sliders and flip phones and that's about it) so that's why it's refreshing to see this concept cellphone from NEC. 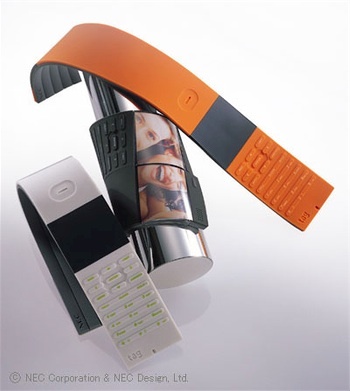 Dubbed the tag, the cellphone is made of a malleable rubber that "remembers" what shape it's in. Since it's malleable, it's conceivable to wear it on your belt clip, shirt pocket or like an arm band. Just think of all the new fashion trends that will start because of the tag. Like nearly every interesting concept in the gadget world, the tag isn't currently scheduled to be commercially available. Even if it does, it'd probably spend several years in Korea before ever making it stateside where it'd be crippled by the Verizon Wirelesses and Cingulars out there.